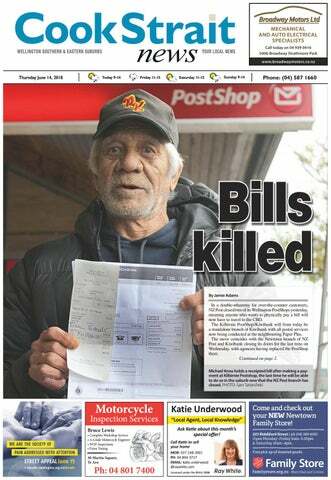 The largest circulating newspaper in Wellington Southern and Eastern suburbs. often have concerns about the impact their diet has on their own health and the environment,” Amanda says. Meat Free Week was founded by Australians Lainie Towner and Melissa Hobbs in 2013, as a project to raise awareness of the downsides of the meat industry. It now operates in Canada, New Zealand, the United K ingdom and the United States, and is supported by groups, including PETA and Greenpeace, and people, including Jamie Oliver, Paul McCartney, Joanna Lumley, John Bishop, and Chris Darwin (great-great-grandson of Charles Darwin). The society is posting to Facebook daily with meal planners and recipes, and has a guide for finding vegan restaurants on its website, to support the week. Vegans are encouraging people to eat fruit and vegetables during Meat Free Week. the Vegan Society reporting the health benefits of veganism. It responded in this way. “We promote eating Quality Mark beef and lamb as part [of] a balanced and healthy lifestyle,” marketing manager Kit Arkwright says. inbrief news Clamping at Park and Rides now possible The Greater Wellington Regional Council is introducing terms and conditions to Park and Ride carparks in an effort to bring these facilities under control. The terms and conditions have been introduced to enable the council to clamp or remove vehicles breaching the rules at the cost of the owner (up to $350). However, an educational period will be undertaken, issuing all offending vehicles with warning notices first, unless the vehicle is parked dangerously or blocking other users. The council will be erecting signs at Park and Ride locations and running an awareness campaign alerting users to the changes. USA vs Canada ticket giveaway The Cook Strait News has a double pass to give away for the New Zealand Ice Hockey Classic 2018, which features a game between USA vs Canada at Wellington’s Westpac Stadium on Saturday, June 23. To enter the draw email your name and phone number to win@wsn.co.nz with “Ice Hockey Classic” in the subject line. The winner will be drawn on Monday June 18 and PDFs of the tickets emailed to the winner. people of Wellington the best we can offer.” The services previously operated from six properties spread across south Wellington, and the construction of the new building has been mainly funded by the sale of the old properties. The official opening was followed by a community concert that evening, and an open day including building tours on Monday. This private bus service has been operating for 17 years. Sponsored by Harbour City, Guardian and The Wilson Funeral Homes. Today is World Blood Donor Day whereby the New Zealand Blood Service (NZBS), along with countries around the world, celebrate blood donors. The NZBS says the day is a chance for it to give a “heartfelt thanks” to the 110,000 blood donors who help save over 29,000 lives across New Zealand every year. “Giving the gift of life through donating blood is a completely selfless act, and we feel it is worth celebrating,” spokesperson Asuka Burge says. To become a blood donor go to nzblood.co.nz or call 0800 GIVE BLOOD. Fare: A donation to Wellington Free Ambulance would be greatly appreciated. inbrief news Wastewater upgrade in CBD Council subsidiary Wellington Water will begin work on Monday at the corner of Victoria and Dixon streets on an important upgrade of the central city’s wastewater network. The six-month project will include the construction of a new underground pump station at Volunteer Corner and an upgrade of the pipes beneath Dixon St that connect to the wastewater mains on Willis St. Wellington Water spokeswoman Tonia Haskell says the project will also provide additional resilience to the city’s wider wastewater network. The project is anticipated to be completed by the end of the year. Vulnerable customers done over: Survey Consumers getting their electricity from prepay power retailer Globug are more likely to get bad service, Consumer NZ’s latest satisfaction survey has found. Consumer NZ head of research Jessica Wilson said Globug’s ratings were alarming because the company provides power to some of the most vulnerable consumers. Globug customers must pay for power in advance. They also pay a fee (from 20c to 75c) each time they top up their meter. The survey found a significant number of households were having trouble paying their bills. tion currently on display at the Central Library, which will be carried to the Whairepo Lagoon then floated out and set on fire. The procession will begin from the library on June 21 at 5.30pm.  To buy tickets to Eat The Film go to www.loemis.nz/wicker. html. which means a net gain for us of about $2m a year,” he says. The 10-Year Plan has strong public support - 72 percent of 2066 submissions agreed with the Council’s vision for Wellington. Justin also notes the city’s future was strongly represented, with 19-30-year-olds making up 25 percent of submitters despite being just 19 percent of the city’s population. Nearly 50 percent of submitters were aged 40 or under. The 10-Year Plan will be adopted at the full Council meeting on June 27. CANCAN FLOWERS HELP IN DIABETES? FLOWERS HELP IN DIABETES? Children are learning Te Reo through board games and puzzles thanks to some new additions to the Brooklyn Toy Library. Five puzzles, two games and several Maori alphabet blocks were purchased after a $399 grant from the Wellington Children’s Foundation was received. payment methods. The council will pay for the new readers, which are expected to accept the ANZ cards. If motorists have received a ticket since the beginning of May 2018 after being unable to use a P&D machine they are urged to follow the appeals process that is outlined on the parking ticket. The council will treat the appeals on a case-by-case basis – using its knowledge of which machines are operating and which have malfunctioned. All your carpet needs covered Carpetech helps its customers look after their carpet – so they can really get the best out of it. The business, based in the city centre, has been maintaining, repairing and cleaning carpets across the capital for almost 30 years. Owner Boyce Jenner said his job was to extend the life of carpet. Want to know your Home’s value in today’s market? and conservation, double glazing – repair and retrofit and picture framing. All work undertaken includes repairs, plastics, automotive and marine glazing, furniture glass – table tops, shelving, cabinet and oven doors. Safety management is important to The Glass Shoppe, which has always used principles of eliminating or at least minimising risk in the high risk industry of glass and glazing. The firm is proud that in 36 years of business they have never had a serious accident or been investigated or questioned by safety management authorities. And finally, the firm prides itself on three essential elements: service, workmanship and price. All Insurance Work and WINZ quotes welcome. CHEERING ON THE ALL BLACKS!! IF PLAN A FAILS, REMEMBER THERE ARE 25 MORE LETTERS. Govt ‘more trustworthy’ than churches A new study shows the number of New Zealanders who trust government has risen substantially since 2016. The Colmar Brunton survey asked 1000 people across the country how much they trust key groups such as government ministers, police, medical practitioners, churches, charities, small businesses, the media and bloggers. Asked whether they trust the government to do what is right for New Zealand, 65 percent now answer yes, compared with 48 percent in 2016. 2019) landlords have been slow to upgrade properties, Miranda says. “In the meantime, curtains are something the tenant can do right now. We’re happy to provide that service with the ongoing support of so many generous Wellingtonians.” Donations of clean, mould-free curtains can be made at Sustainability Trust’s drop off point at the Citizen’s Advice Bureau at the Kilbirnie Lyall Bay Community Centre. Otherwise they can be handed over at the trust’s EcoCentre in Forresters Lane (off Tory St).  People can also support the Curtain Bank by volunteering their time. Those interested can email curtainbank@sustaintrust. org.nz. readers have their say... Find out the WORD on the Street. Question: What do you do to cope with cold days during winter? Smoking Hypnosis - Save so much more than just your lungs! For more information, or to make a booking please Contact Daniel Steadman at CapitalNtrance, Karori, Wellington. Ph: 021 203 3374.
Letters on issues of community interest are welcomed. Guidelines are that they should be no longer than 150 words. They must be signed and a street address provided to show good faith, even if a nom de plume is provided for publication. The editor reserves the right to abridge letters or withhold unsuitable letters from publication. Send or fax them to the address on page two, or email them to news@wsn.co.nz. Please note that your name and street address must also be provided in e mails. weather doesn’t start till late June; and meteorologists cannot forecast which parts of a winter will be the hardest; but this year the cold, windy, wet weather began in mid-May. And we old people know that, as a general rule, those three calendar months are the coldest, wettest, and windiest in the whole year Not only frosts and strong, cold winds, but also rain, hail, sleet, and snow; so it’s clothes dryers as well as space heaters. a link between the creative arts and economic development, particularly in technology. It shows that not only is Wellington by far the most creative city, with more than 10,000 people employed, but its economy is also by far the most knowledge intensive. Earlier this year, Wellington Mayor Justin Lester announced a $127 million injection into the city’s arts and creative sector. According to Infometrics, at the beginning of the millennium the creative sector contributed slightly more than 5 percent of the city’s GDP, which grew to 6.5 percent by 2016. ReCut will return to Matariki a fifth time. The July 7 fireworks on the harbour will be Matariki’s main drawcard. host ‘Oneone,’ which the council describes as “an amazing work of living art... a haunting sensory experience featuring digital cinema and a lone dancer on the water.” Te Papa will hold a series of events, including a ritual, complete with fire and Maori storytelling, on June 14, with storytelling continuing until June 16, and kapa haka the following weekend. It is also allowing the public to view Matariki-inspired artwork by Michel Tuffrey and local secondary school students on its shop window on June 14-15. R E E T N VOLU NOW WANT TO MAKE A DIFFERENCE? KEEN TO HELP GET KIDS OFF THE COUCH AND INTO NATURE? Join the Scouting Adventure as a volunteer leader! Go to www.scouts.org.nz to ﬁnd a group near you, or call 0800 SCOUTS. some very defined pathways for those interested in counselling, youth work and events, but we are equally interested in volunteers seeking other skills-based or general volunteer roles. assisting with specialist projects, to goods and food distribution, to setting up for a book fair, to planting projects, to beach clean ups. Business volunteers help to build the capacity of the community to deliver their valuable services and gain a tremendous sense of personal satisfaction in the process. LIFE – YOU STILL CAN’T BEAT EXPERIENCE However as we get older our immune system changes and we become more vulnerable to illnesses like flu. P3 Research in Wellington is studying an investigational treatment that may help your immune system respond better to this season’s flu vaccine. To participate you must be 65 years old or older and have at least one of the following conditions; Asthma, COPD, Type II Diabetes, Congestive Heart Failure, or Current smoker. Study participation is for 5 or 7 weeks and involves either 5 or 6 visits to P3 Research in Wellington. You cannot take part if you have already had a flu vaccination this year. streets and myriad people, the food and political energy, the cable car and cenotaphs, the wharves and, as the title suggests, the big weather. Re-released on June 1, Big Weather comprises 100 poems and is organised into various sections with specific themes. It begins at the inner city and harbour, moving into the suburbs and parks, before heading to outer areas - and into the 21st century. Musings from late writers of the past come from the likes of James K. Baxter (famous for likening Wellington to a “sterile whore of a thousand bureaucrats”), Katherine Mansfield, Allen Curnow and Robin Hyde. They are accompanied by the texts of many contemporary poets, from both New Zealand and abroad. They include well-known bard Sam Hunt, Victoria University Emeritus professor Bill Manhire and Dinah Hawken who describes the harbour as “hallucinating”. Even the author makes a contribution with Contents of a Breeze, Wellington, written in 1990. The book was first published in 2000 and reissued in an expanded form in 2010. It was originally co-edited by Louise St John, who died in 2009. Greg has dedicated the latest edition to her. Big Weather is now in its third edition. Trust and Kaibosh Food Rescue. “Newtown is a thriving and diverse community,” Ken says. “The work of the NCCC staff plays an important role in connecting our people and I am delighted to be able to offer my skills to the NCCC Trust Board and support them” The NCCC Trust is looking for one more skilled person to join the board. Members meet once every two months for an hour and there are occasionally extra meetings to attend. They are looking for someone who is passionate about Newtown and potentially someone who has finance and chair skills.  Those interested should contact Renee Rushton on (04) 389 4786 (office) or emailing info@newtowncommunity.org.nz. symptoms have gone and the condition has resolved even without the use of antibiotics. Avoiding antibiotics is the preferred situation to minimise the overuse of antibiotics and help prevent antibiotic resistance from occurring. However there are certain circumstances where your GP could prescribe antibiotics, e.g. extreme or severe pain, fever over 38.6 degrees Celsius, or signs of cellulitis, i.e. a skin infection such as a fast spreading hot red rash. Also you may need to visit your GP for antibiotics if the condition initially improves but then worsens and is prolonged. In some cases sinusitis can recur and last longer than 3 months. This is known as chronic sinusitis and may need a referral from your GP to an ear, nose and throat (ENT) specialist There are things that you can do at home that will help sinusitis such as getting plenty of rest and drinking plenty of fluid. Extra fluid helps to thin the mucous so that it can drain away more easily. Gently blowing the nose, one nostril at a time is also effective. Holding a warm flannel or compress over the inflamed area can help to ease the pain and this can be done for a few minutes several times a day. Inhaling steam from a bowl of hot water may give some relief but care must be taken to avoid scalding and this is especially important with young children and is therefore not encouraged. Applying a salt water solution to the nostrils can also help to ease the congestion. Homemade salt solutions can be used or they can be purchased from the pharmacy. A humidifier can also be helpful, as is stopping smoking and avoiding known allergy triggers. Good hand hygiene can help to keep the spread of infection and prevent reinfection from occurring. There are medicines available to use for sinusitis which includes pain relief such as paracetamol or anti-inflammatory drugs such as ibuprofen. Your Self Care pharmacist can also give you advice on decongestants that can be used to help by drying up the mucous and unblocking the nose. These are available as nasal sprays or drops and it is very important to use these for a few days only, after 3 to 5 days their usage should be stopped. If they are used continuously for long periods of time they can cause a condition known as rebound congestion, which is more congestion, adding to the problem. Decongestants are also available as tablets, some are only available with a GP’s prescription while others can be purchased from the pharmacy. Care needs to be taken to see if pain relief and anti-inflammatory drugs have been included in the same product when buying these over the counter. Discuss this with your Self Care pharmacist to find out. Other medication available from your pharmacist are antihistamines, which can be used to help dry up the nasal secretions especially if allergies are the cause of the symptoms. Your Self Care Pharmacist can provide you with Self Care fact cards for more information on coughs, colds and flu and how to protect yourself this winter. Linda Choie, Alana Pretoria, Androulla Kotrotsos (owner) and Victoria Pickering. Jan Bolwell and Mona Williams combine They discovered the first ballet they ever forces in Once Upon a Dance, an hour-long saw was The Nutcracker, albeit on different Composed Watling 11th.recount Nov. 2015 show which tells the story of their dancing sides by of Tony the globe. They in words lives. and movement how it felt to be in the They are both members of Crows Feet audience. As young people they adored Dance Collective, a contemporary dance American musicals and knew all the songs. company for mature women in Wellington. “We have great fun in this show doing Jan is also a playwright and actor, and a favourite number from South Pacific”. teaches dance exercise classes on the Kapiti Apart from storytelling, Jan and Mona Our summer pools were built by us. Coast. Mona is a well-known professional dance and sing, and the work is richly Blends in well did cause no fuss. storyteller touring frequently around illustrated with projected images from their With hydro cause splash. Australasia. lives.slide But will it’s not allalight and amusing, And toJan it many Jan, who directs Crows Feet, says: “Mona notes.people dash. Through“When nativeyou bush and[Jan wiggle. and I come from such different cultural getwetotwist our age is 68 and From the children and dancing backgrounds. Mona grew Mona is 75]brings you’vea giggle. experienced a lot of Severnheartache, days a week the is open. up in what was once British Guiana and and weplace don’t shy away from learned her traditional dances, as wellHot as summer telling days thesewe stories as hopen! well. all are studying ballet. “In my case it is dealing with two bouts of “I grew up in Dunedin and learned breast cancer and with Mona, it is a broken Highland dancing and then modern dance marriage. Dance helped us overcome these Public Notice with Shona MacTavish,” she adds. personal traumas.” “We have found it fascinating to put these  Once Upon a Dance shows at Te Whaea: OF THE D AY National Dance & Drama Centre, Newdifferent dance traditions beside each other Wainuiomata Squash Club in a theatrical way with the help of our town, on Friday June 22 at 7.30pm, then on June 23 andAGM 24 at 4pm. Tickets can be director, Ralph McAllister.” and Mona also have a lot in common. booked at eventfinda.co.nz. 51.Jan J.K. Rowling 7.00pm chose the Monday 30th November unusual At the Clubrooms name ‘Hermione’ Corner of Main Road so young and Moohan Streets, Wainuiomata girls Those wanting to spend some time wouldn’t in the warmth this weekend, and are be teased curious to check out both established Bringing local news for being and upcoming artisans, should nerdy! to the theMidwinter community visit Knack Market at Berhampore Primary School on Situation VacantSaturday. The quarterly event, which has been running for over 10 years, has gained a reputation as the best little school handcraft market in Wellington. The market offers an assortment of original, handmade items including jewellery, bespoke woven woollen fabrics and creative knitting. There will also be honey harvested from the school’s very own beehives that the children help look after, as well as home baking and Havana Deliverers Required coffee onin offer. This year there will be a variety of Area 1: Momona, Mohaka, Kawatiri - Kaponga. hot soups, and made-to-order waffles as well. There will be plenty of free parking and eftpos available.  The Midwinter Knack Market Pupils give their thumbs up at last year’s will run from 9:30am-1:30pm this Berhampore Midwinter Knack Market. PHOTO: Saturday, June 16 at Berhampore accounts@wsn.co.nz Supplied School, Britomart St. SECURE STORAGE 14sqm $42 per week. Wainui Self Storage, Waiu St, 0274805150. Applications are available at our recruitment office or at the security gate based in the Ngauranga George in Wellington. Contact Barry 472 7987 or 021 276 6654. 37.Cherished(8) Cherished(8) 52.Boredom(5) Boredom(5) ACROSS 37. 52. ACROSS (abbr) (3)(3) Angry (5)battleship(11) ACROSS (abbr) 51. Angry (5) 38. Suspended swinging weight(8) 53. Large 1.ACROSS Showman’scovered coveredwagon wagon(7) (7)51. 38. Suspended 53. Large battleship(11) 1. Showman’s 33. Sphere (3)(3) swinging weight(8) Solidify by cooling (7) 1.5.Result (5-6) 33. Sphere 52. Solidify by cooling (7) 1.Chase(quarry) Result (5-6) to lair (3,2,6) 52. 41.Designate(7) Designate(7) 54.Error(7) Error(7) 41. 54. 5. Chase(quarry) to lair (3,2,6) 38.43. U.S. horse race; ... ... Derby (8)(8) 53.53. Anaesthetic (5)(5) 7. (7) (7) 38. U.S. horse race; Derby Anaesthetic 7. Scoundrel Transparent fabric silk(7) 11.Scoundrel Dig(5) 43.Restrained Transparent fabric ofofsilk(7) 11. Dig(5) 40. (8) 54. Humbleness (7) 11. Pulls (5) 40. Restrained (8) 54. Humbleness (7) 11. Pulls (5) 44. Breed of sheep(6) DOWN 12.Most Mostunsightly(7) unsightly(7) 44. Breed of sheep(6) DOWN 12. 42. Casual (7)(7) 55. Friendship (11) 12. Deviousness 42. Casual Friendship (11) (5) Deviousness 45. Monster( 1.55. Obtain bybegging begging 13.12. Taunts (5) (7) (7) Fem) )(6) (6) 45. Monster( 1. Obtain by (5) 13. Taunts (5) Fem 44. Annual calendar (7)(7) 13. Excellent (5) 44. Prize(5) Annual calendar Excellent (5) 2.Fall Fallback back(into (intoillness)(7) illness)(7) 14.13. Costly(9) 46. 2. 14. Costly(9) 46. Prize(5) 46.47. Scoffs (6)(6) DOWN 14. Alert (9) (9) 46. Scoffs Alert 3.DOWN Austriancapital(6) capital(6) 15.14. Sinners(9) Object(5) 3. 15. Sinners(9) 47. Object(5) 47. Manservant (6)(6) 1. Austrian Sound (5)(5) 15. 15. So So (9) (9) 47. Manservant 1. Sound 4. Marine(8) 16. Abound(4) 49. Expel fromnative nativecountry country (5) 4. 16. Abound(4) 49. Expel 48. Form offrom expression (5)(5) (5) 2. Marine(8) Sent (11) 16. 16. Directs (6) (6) 48. Form of expression 2. Sent (11) Directs 5. Disencumber(7) 17. Parade(7) 5. Disencumber(7) 17. Parade(7) 49.49. Water vapour (5)(5) 3. Shy (8)(8) 18. 18. Skull (7) (7) Water vapour Shy Skull 6.3.Sister’s daughter(5) 19.Kiwi Kiwi golfer,Frank Frank ...(6) 6. daughter(5) 19. golfer, 50.50. Gambol (5)(5) 4. Sister’s Of public revenue (6)(6) 21. 21. Disorder (4) (4) ...(6) Gambol 4. Of public revenue Disorder Solution 7. Get(6) 23.Mean(6) Mean(6) SOLUTION 7. 23. SOLUTION 5. Get(6) Turn outwards (5)(5) 23. 23. Racket (3) (3) 5. Turn outwards Racket lastApril week 13, – 7 June 8.Lively Livelydance(8) dance(8) 26.Hand Handoperated operatedfire-fighting fire-fighting For 2005 SOLUTION SOLUTION 8. 26. 6. Constrict (7) 25. 25. Take by sips (3) 6. Constrict (7) Take by sips (3) For April 13, 2005 9. Flawless(11) device, ... pump(7) Solution last week, 11 November For For July April 28, 9, 2003 2004 For For July April 28, 9, 2003 2004 9. device, 7. Flawless(11) Has high morals 27. 27. Stake (4)... 7. Has high morals(8)(8) Stake (4)pump(7) 10.Writing Writingtables(5) tables(5) 29.Cast Castoff(4) off(4) 10. 29. 8. Reduce (6)(6) 8. Reduce 28. 28. Artlessness (7) (7) Artlessness Accolade(7) 30.30. Main point(of story) (3) 16. 30. Main point(of story) (3) 9.Accolade(7) Sanction Low chair;Chaise Chaise ... (6) 9.16. Sanction (7)(7) 30. Low chair; ... (6) 18. Tend(5) 32.32. Offer(3) 18. Tend(5) 32. Offer(3) 10. Audacity Expert; ... hand 10. Audacity (5)(5) 32. Expert; ... hand (3) (3) 20. Commanded(7) 34.33. Component(4) 20. Commanded(7) 34. Component(4) 16. Arrange in steps Strange 16. Arrange in steps (7)(7) 33. Strange (3) (3) 21. Hotel(3) 35.34. Longed for(7) 17. ‘Old Blue Eyes’ Frank ...(7) Zealous (6) 21. Hotel(3) 35. Longed for(7) 17. ‘Old Blue Eyes’ Frank ...(7) 34. Zealous (6) 22. Young fox (3) 36.35. Muse(6) 19. Competitor (5) In brisk time(music) 22. Young ofofaafox (3) 36. Muse(6) 19. Competitor (5) 35. In brisk time(music) (7) (7) 24. Calculate 39.36. U.S. writer, ...Hemingway(6) Hemingway(6) 20. 20. N.Z. Prime Minister U.S. state (4) 24. Calculate 39. U.S. writer, N.Z. Prime Minister 36. U.S. state (4)... trigonometrically(11) 40.37. Short chopper(7) 1975-84 Robert Biblical vessel 1975-84 SirSir Robert ... ... (7)(7) 37. Biblical vessel (3) (3) trigonometrically(11) 40. Short chopper(7) 25. Unexploded bomb(3) 42.39. Sheep enclosure(4) 22. Boils Curve (3) 22. Boils (7)(7) bomb(3) 39. Curve (3) 25. Unexploded 42. Sheep enclosure(4) 27. Warble(5) 46.41. Mirth(9) 24. Catch Cupid 24. Catch (3)(3) 41. Cupid (4) (4) 27. Warble(5) 46. Mirth(9) 28. Spot on adice dice (3) 48.43. Schoolmaster(9) 26. Group whales Exposed to air 26. Group ofaof whales (3)(3) 43. Exposed to air (7) (7) 28. Spot on (3) 48. Schoolmaster(9) 31. Turkish govenor(3) 50.45. Frighten(5) 29. Topic Female relatives 29. Topic (5)(5) 45. Female relatives (6) (6) 31. Turkish govenor(3) 50. Frighten(5) 33. Put on(clothes) (3) 51.48. First (7) 31. Uninvited guest (4-7) An endless time(Lat) 31. Uninvited guest (4-7) 48. An endless time(Lat) (9) (9) 33. Put on(clothes) (3) 51. First (7) Deoxyribonucleic acid handed people(inf) Deoxyribonucleic acid 49. 49. LeftLeft handed people(inf) (9) (9) 32.32. Commercial buildings and maintenance work. Quality assured. Phone: Shane - 021987752. Miramar Bowling Club Incorporated has applied to the District Licensing Committee in Wellington for the issue of an off licence for the premises situated at 33A Puriri Street, Miramar, Wellington 6022 and know as Miramar Bowling Club Lawn Bowls and community sports. Houses, bathrooms, kitchens & decks. Experienced licenced builder. Trade Qualified. The general nature of the business conducted (or to be conducted) under the licence is Lawn Bowls. The days on which and the hours during which alcohol is (or is intended to be sold) under the licence are Sunday – Thursday 8.30am – 11.00pm and Friday, Saturday, Public Holidays and New Year’s Eve 8.30am – 1.00am. The application may be inspected during office hours at the Wellington District Licensing Committee, Ground Floor, Service Centre, Council offices, 101 Wakefield Street, Wellington. Any person who is entitled to object and who wishes to object to the issue of the license may, not later than 15 working days after the date of the first publication of notice of the application in a newspaper in accordance with the Act, file a notice in writing of the objection with the Secretary of the District Licensing Committee to PO Box 2199, Wellington 6140. No objection to the issue of a license may be made in relation to a matter other than a matter specified in section 105(1) of the Sale and Supply of Alcohol Act 2012. This is the first publication of this notice. Health & Wellbeing THERAPEUTIC MASSAGE THERAPY. Qual in NZ. Dip.Th.Mass. Twelve yrs exp. Claire. Newtown 0274132782.
house plans. Free estimates provided. Call Doug on 934-1398. Phone Susan. 04 387 4277. Refs avail. APLIN, Janice Cecile: Jun 6, 2018 GRAY, Mihi: Jun 8, 2018 JAMIESON, John: Jun 10, 2018 KOOISTRA, Theo Lambertus: Jun 8, 2018 Public Notices ADVERTISING TERMS & CONDITIONS All advertisements are subject to the approval of Wellington Suburban Newspapers. Advertisements are positioned entirely at the option of The Publisher & no guarantee of placement is given. Applicable loadings apply only to the specific placement of strip or island advertisements. Placement & approval is at the discretion of The Publisher. While every effort will be made to publish as instructed, The Publisher accepts no liability for any loss caused through loss or misplacement. The Publisher reserves the right to reject any advertisement considered unsuitable for publication. Advertisements will be charged on the size of the material supplied or the space ordered whichever is the greater. It is the responsibility of the Advertiser or Advertising Agent to notify Wellington Suburban Newspapers of any error within 24 hours of its publication. The Publisher is not responsible for recurring errors. To obtain a classified space order (defined as annual commitment of advertising space or spend) please speak to your advertising representative. (Surcharges may apply if commitment levels are not met or cancellation of a space booking & or contract). Cancellation: neither display nor classified cancellations will be accepted after the booking deadline. No credits will be issued to classified package buys that have commenced their series. If an advertiser at any time fails to supply copy within the deadline, it is understood & agreed that the last copy supplied will be repeated. Specific terms & conditions apply to certain classifications. These may relate to either requirements & conditions set by industry standards for the advertising of certain goods & services, or set by The Publisher. Please speak to your advertising representative to obtain a full copy of these. Advertisers agree that all advertisements published by Wellington Suburban Newspapers may also appear on a relevant website. Trades & Services Registered Licensed Builder with over 25 years experience . Residential Building, Renovations & Extensions. dive, scoring 262.92 to take the last place on offer to next year’s premier international meet. They edged out Canada’s powerful team by 24 points. Diving New Zealand convenor of selectors, Simon Latimer says: “This is further good news for the sport in New Zealand following the Commonwealth Games and shortly before a team of five new representatives leaves for the World Junior Championships in Ukraine in July.” Wellington’s Arno Lee is among those five. including freshly-painted court markings, new goal posts, new gear bags and match balls. Over the past five years ANZ has supported teams, clubs, schools and players all over New Zealand to the value of nearly $500,000. “We are proud to support netball at every level, from grassroots right up to the elite ANZ Premiership and Silver Ferns.,” Sue McGregor, ANZ Head of Sponsorship, says. “We know sometimes all you need is just that little bit of extra help to achieve your goals, so we are committed to helping as many netball fans as we can.” Wellington netball clubs, teams, players and fans can say what they need to help achieve their netball goals at anzcourtside.co.nz. has three championships in nine finals appearances. For me, growing up, my three favourite sportsmen were Black Cap veteran Chris Harris, All Black first-five Andrew Mehrtens and Canterbury rugby captain Todd Blackadder. All three were incredibly reliable but, in my more realistic moments, each had their weaknesses. Harris never was a test match regular, Mehrtens wasn’t a great defender and Blackadder had a mediocre All Black career. However each of them were instrumental in me loving sport. The same will be happening with kids looking at Beauden Barrett, Ross Taylor and Kieran Read. It’s simply a generational thing. There’s no right or wrong answer, only fodder for friendly debates for years to come. Brenda encourages people who are looking for a nice home for their family members to come to Johnsonvale and have a personal tour. hand 24 hours a day. The Home caters for day and respite care options to enable relatives to have a break. The relatives can rest easy knowing their loved ones will be well cared for. Brenda encourages people who are looking for a nice home for their family members to come to Johnsonvale and take a personal tour.